We have moved! We are now in the Impact Jiu Jitsu gym located at 819 N. Hwy 99 W, between Sandwich Express and Mikey's Pizza. See the Impact Jiu Jitsu website or Facebook page for the latest on their class schedule. Via Potentia is a Latin phrase that means "Path (or way) of Hidden Strength." We provide practical, no-nonsense self-defense and fitness training in a friendly atmosphere. We emphasize the value and equality of human life, conflict and injury avoidance, fighting to escape, and techniques that are not based on size, strength or advanced skills. We do not require financial contracts, long term obligations, uniforms, foreign rituals, belt fees or the like. All Via Potentia courses are led by the founder of Via Potentia, Seth Murray. Impact Jiu Jitsu classes are led by John Goforth and other instructors he has approved. Facebook page for Via Potentia. Facebook page for McMinnville Impact Jiu Jitsu. Adult, Youth and Family Classes (age 13 and up) meet on Monday and Wednesday from 6:30 to 8:00 PM. This is the complete Via Potentia conditioning and self defense curriculum. New terms start each January, April, July and October. It is best to start at the beginning of the month, but it is okay to start late; we'll help you catch up. Your first two weeks are a no-obligation "tryout" period. Our techniques and exercises include comprehensive sparring and grappling, heavy bag striking, partner drills, dynamic stretching, static/isometric stretching, calisthenics, stick fighting, forms and board breaking. 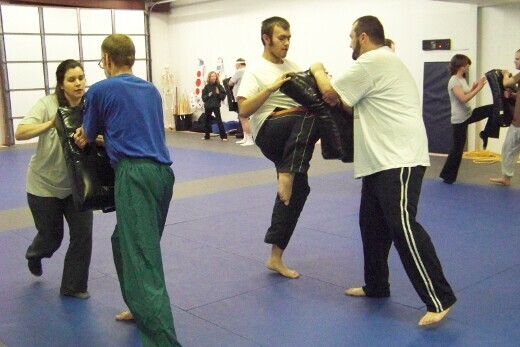 The fighting techniques are designed to address real assault situations, and the physical conditioning portion was developed over years of research and in consultation with various physical therapists. Our atmosphere is challenging, but accomodating. We aren't your "masters," but work together as respectful friends. We will work with you, at your pace, to help you develop good conditioning and self defense skills. Classes are taught by experienced, skilled instructors who also know First Aid, CPR and AED use. A full First Aid kit and AED are on site. To get started call, email, or drop by the gym before class (wear clothes that will be comfortable for exercise). You may also want to go through our free public seminar first. It is up to you. College credit (PE) is available if you sign up through Chemeketa Community College. Look for the "Personal Protection" class listing, PE185PA. Class syllabus. Cost: We ask for $150 for a three-month training term. Additional family members get half off. Additional discounts and need-based scholarships are available. MMA and ongoing participants need to purchase their own sparring gear. There are no other belt/test fees, membership costs, uniform or gear purchasing requirements. Referrals and returning participants get an additional 10% off. Physical Conditioning: Exercises to help you improve or maintain your range of motion, flexibility, strength and endurance. Most martial arts programs exercise in a way that causes or predisposes one for injury, but we've arranged them in a way that you still get great benefits, can go at your pace, and have a much lower chance of injury; joint conditioning and dynamic stretching at the beginning of class, and calisthenics and static stretching at the end. Physical conditioning is a formal part of the classes, and takes up about half of our class time. Self Defense: Via Potentia was developed specifically to teach basic unarmed self defense skills from all ranges, upright or on the ground. Dozens of specialized drills help you become aware of, avoid and de-escalate dangerous situations, and fight to escape if necessary. The techniques include palm strikes, hammer fists, elbows, knees, low kicks, clawing, headbutts and others; the goal is develop powerful, injury-causing combinations. The general targets are eyes, ears, neck, liver, lower abdomen, groin, knees and feet. There is a lot of work with partners and heavy bags. We also strongly encourage the use of improvised and conventional weapons, especially pepper spray and handguns (adults only, obviously). We train with sticks in class. No uniform or special equipment purchases are required; a mouthpiece is recommended (and a cup for men). Martial Arts: Forms, board breaking, no- and light-contact sparring, advanced kicks, strikes and acrobatics, discipline and awareness training for self improvement, demonstration and competition. Martial arts training is an individual pursuit, is touched upon in our basic program, and available in more detail for children and those who are less interested in the self defense or sport facets of Via Potentia. Adult and youth participants are encouraged to work on martial arts skills as they progress. All martial arts have about 90% of their techniques in common. Via Potentia is different in that our techniques are introduced in a carefully-researched order, our forms are much more challenging (and include acrobatics at later stages), and we do not charge for tests. Those who wish to pursue Via Potentia as a martial art should get a uniform. Martial/Combat Sports: The self defense program incorporates contact kickboxing, pankration/MMA-style sparring and submission grappling (no striking) for friendly competition and personal fitness. Classes focussing on advanced grappling and MMA skills are held on Tuesday and Thursday nights, respectively. Those wishing to pursue kickboxing or MMA-style matching need to acquire their own sparring gear. Weapons Training: Classes include basic stick training. We use sticks of different sizes to simulate various improvised weapons that might be used for self defense (including knives). We also provide gun safety training for adults who are new to handguns or wish to acquire a concealed carry permit. Life Skills: Participants are encouraged to complete training in CPR and First Aid with the Red Cross or equivalent organization (training is offered through Via Potentia on a limited basis). We also offer handgun safety training to adults by appointment. No Nonsense: All training takes place within the context of respectful friendship, practical application and traditional ethics that uphold the dignity of human life. No metaphysical, political or environmental mumbo-jumbo. No belt ranking BS. No fantasy moves that would never work in real life. No pressure to buy uniforms, ranks, or dump money into the group. We don't require or expect you to serve the organization; we know you have a real life in the world, and we are here to support you as best we can. Select the topic of interest from the menu at the top of the page, or answer the questions, below, for some specific advice to help you get started. You will be treated with respect and dignity, regardless of your age, condition or abilities. Via Potentia exists to serve and assist you, not separate you from your money or make you conform to a foreign program. We will never dismiss someone from Via Potentia purely for failure to pay the membership fee. We will never fabricate and charge you for training or tests that don't actually benefit you. The training will be adapted to your abilities; we will challenge you to push yourself, but you can go at your own pace and do not have to "keep up" with anyone else. You will never be pressured to buy uniforms, equipment, pay silly test fees, or sign long term contracts. The only document we'll ask you to sign is a waiver of liability. You will learn self defense principles and skills that could save your life. The principles and rough basics can be learned in the first term. It usually takes 2-3 terms to develop effective skills. You will improve your physical fitness -- strength, flexibility and endurance. Most people experience measurable improvements in the first term, with gradual improvements each term thereafter. Some people lose substantial weight. Assuming you consistently participate in the program, practice/exercise outside of class at least once per week and manage other areas of your life like diet, sleep and stress, we commit to the above, and will refund your tuition for the term in question if we fail. We are presently collecting survey information in regard to our classes in McMinnville. If you live near McMinnville and are interested in participating, we invite you to take the survey; all participants will be eligible for half off of their first term of instruction.